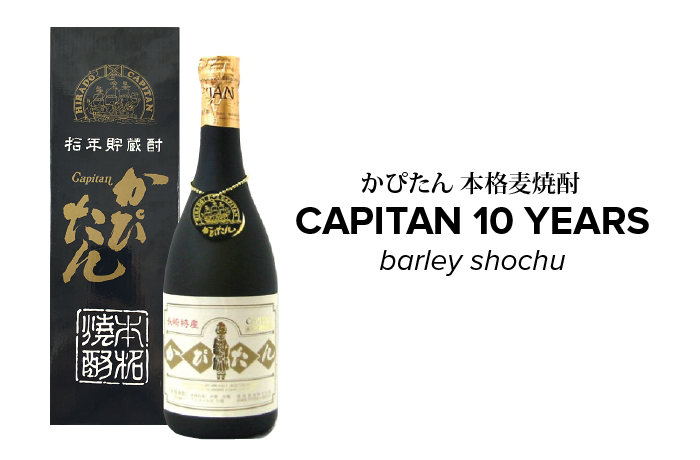 Capitan 10 Years Barley Shochu is ripened in an oak barrel for 10 years resulting in a significantly deeper, complex brew. Capitan is thoroughly aromatic with a pleasantly rich fragrance of oak from the barrel which harmonizes exquisitely with its earthy barley flavor. The taste is mellow on the tongue with prolonging subtle sweetness. Capitan, meaning “pioneer” was named in the memory of the first trade that Portuguese missionary, Xavier Capitan, has started during 1550s in Hirado-city, Nagasaki.